Back and neck pain are among the most common reasons for doctor visits. 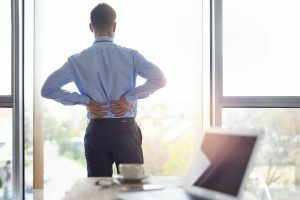 Unfortunately, nearly everyone experiences it at some time in their lives due to the everyday stresses imposed on our spines. However, when back pain or injury occurs there are several options available to remedy it. Under most circumstances, back and neck pain are able to be treated conservatively with physical therapy and prescription medication. In some instances, injection therapy may also be utilized. When surgical intervention is needed, Orthopaedic Associates of St. Augustine is proud to have Brian Haycook, MD on staff as the only fellowship trained orthopaedic spine surgeon in St. Johns County. Dr. Haycook routinely performs the most highly advanced spinal procedures – including cervical disk replacement, vertebral implants, vertebral fracture restoration, fusion and spinal instrumentation. He is adept at minimally invasive surgery which allows for many of these procedures to be done on an outpatient basis and can significantly reduce pain and improve quality of life. Additionally, Dr. Haycook has training in the treatment of scoliosis, a medical condition in which a person’s spine is curved. At the Spine Center, Dr. Haycook is able to closely monitor the curvature of the patient’s spine. Treatment options can range from a customized brace, physical therapy and certain cases may warrant surgery.